SAN FRANCISCO, October 19, 2016 /PR Newswire/ – San Francisco Salt Company ranks #36 on the San Francisco Business Times’ Fast 100 list, released on October 13, 2016. The Fast 100 reflects economic vibrancy in the Bay Area, ranking in the top 100 fastest growing private companies in the area. The companies who made the list exemplify rapid and exceptional growth. Silicon Valley is known to support and claim home to many tech companies, several of which are competing for the top spot on the list. When ranking businesses, the San Francisco Business Times evaluated four key criteria. The company must be: 1) independently held, 2) located in the Bay Area, 3) have a three-year sales history, and 4) have been in business for at least 3 years. After fourteen years of evolving steadily, the last 3 years have seen rapid growth for the company. The San Francisco Salt Company has become one of the largest suppliers of specialty salts in the United States. San Francisco Salt Company specializes in gourmet salts and therapeutic bath salts, as well as an extensive line of Epsoak Epsom Salts. The company has been expanding its team and is continuously gaining recognition in the independent business market. 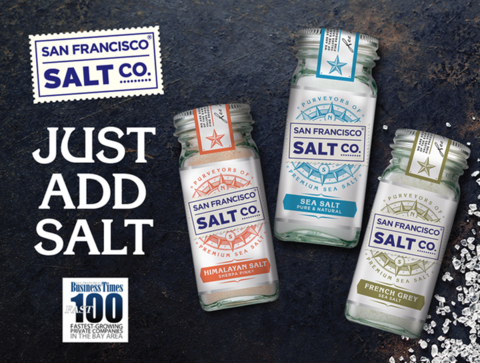 The assortment of salt products offered by San Francisco Salt Company, is an example of their efforts to be at the forefront of the sea salt movement. With a team-driven culture, focused on delivering best-in-class customer satisfaction, the company is positioned to take their sea-salt game to the next level. Launched in 2002, the San Francisco Salt Company was the founder’s entrepreneurial dream and embodies his principals of quality, value, and customer service. They carefully select only the best quality salts from suppliers around the globe for their taste, texture, and appearance. For more information, please visit http://www.sfsalt.com/ or find the brand on Facebook, Twitter, and Instagram.